As the name already suggest it, Polar Explorer is an online video slot with a polar theme and related graphics and symbols. The game is a 5-reels slot with 25 paylines and it was created by Real Time Gaming software developer. The main symbols are theme-related and they include polar bears, seals, a compass, narwhal, ship, the explorer himself, and many others. 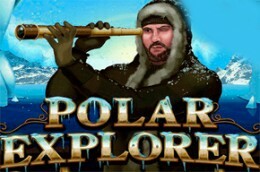 Polar Explorer offers to its players wild and scatter symbols, two random jackpots and 3 bonuses with free games.